Jeanne C. Finley is a videomaker and artist whose work ranges from experimental to documentary forms. Finley's films have been broadcast in the United States, Europe, Canada and Japan and her media work has been exhibited in festivals and museums throughout the world including the Amsterdam Documentary Festival, the San Francisco Film Festival, the Denver Film Festival, Museum of Modern Art in New York, Lincoln Center Festival, the 1993 and 1995 Whitney Biennial, and the George Pompidou Center. She has been the recipient of several grants including a Guggenheim Fellowship, Cal Arts/Alpert Award, National Endowment for the Arts Fellowships, NYSCA Individual Artists Fellowship, Creative Capital Foundation Grant, Arts-Link Fellowship and the Phelan Award in Video. Finley's film and video credits include: Loss Prevention, 2000, O Night Without Objects, a Trilogy, 1998, A.R.M. Around Moscow, 1993, Involuntary Conversion, 1991 and Nomads at the 25 Door, 1991. These tapes have won awards at international festivals such as the San Francisco, Atlanta, Berlin Video Festival, Toronto, and World Wide Video Festival. During 1990 Finley received a Fulbright Fellowship to Yugoslavia where she directed programs for Radio/TV Belgrade. In 1994 she was an Artist-in-Residence in Istanbul, Turkey through a grant from the Lila Wallace Readers Digest Foundation. Jeanne is a Professor of Media Studies at the California College of Arts and Crafts and currently lives in San Francisco with her husband and daughter. Her gallery work is represented by the Patricia Sweetow Gallery in San Francisco and her films are distributed by Video Data Bank, Women Make Movies and Electronic Arts Intermix. Larisa (Lara) was born in 1977 in Osijek, Croatia and currently lives in Sarajevo, Bosnia Herzogovina. She recently completed her studies at the Academy of Fine Arts in Sarajevo. Lara participated in exhbitions at the Sarajevo Center for Contemporary Art in 1998 and at the Biennial of Young Artists from Europe and the Mediterranean in Rome in 1999. Over the years, she has also been involved in actions and performances in Sarajevo. Lara was one of the curators of "Call me Sarajevob", an international video project produced in 2001. Adla Isanovic was born 1977 in Sarajevo, Bosnia and Herzegovina where she currently lives. She completed her studies at The Academy of Fine Arts in Sarajevo in the department of painting in 2001 after spending one semester at L' Ecole d'Art d'Avignon, France. She has shown work at: III Interbalcanic Symposium of Fine Arts Samothraki, Greece; "The Man and his Land" (international exhibition of young artist) in Tornaco, Italy; Expression of Youth, Rampa di Francesco di Giorgio Martini, Urbino, Italy; La Prima VeraÓ, exhibition / closing ceremony of The XV International Festival Sarajevo ,BH; Beyond the Morrow, II Annual exhibition of the Soros Center for Contemporary Arts (SCCA), Sarajevo,BH. Like her collaborator Larissa, Adla participated in creating a series of projects for the rights of people with disabilities ( in collaboration with other artists and the Center for Self- Reliance, Sarajevo). Timur Makarevic is a video maker with a special interest in cinematography. He recently completed a one year residency at the Fabrica Design Center in Italy. Tvico Muhidin was born in 1974 in Sarajevo. He graduated from the Institute for Product Design in Prague and then completed his studies at the Academy of Fine Arts in Sarajevo. His work has been shown throughout Europe and Asia. Selected exhibitions include: "Beyond the Mirror" (First Prize, Sarajevo Center for Contemporary Art, 1998); Sarajevo Film Festival (1998); "Biennial of Young Artists of Europe" (Rome, 1999); Festival of Short Film and Video (Oberhausen, 2000); Museum of Modern Art (Rijeka, 2000); "Faces of Sarajevo"- (Osaka, Japan, 2001). Tvico's keen sense for design manifests itself in his three dimensional work as well as his time-based media pieces. His unusually sharp-witted, philosophical sensibility has been recognized with numerous awards. Working against the grain of traditional documentary, Lynne Sachs (www.lynnesachs.com) makes non-fiction films, videos, installations and web projects that push the borders between genres, discourses, radicalized identities, psychic states and nations. Her films expose the limits of verbal language by complementing it with complex emotional and visual imagery. For the last decade, Lynne’s filmmaking has taken her to sites affected by international wars -- where reality is constituted in the space between a community's collective memory and her own subjective perceptions. This body of work includes: Which Way is East: Journals from Vietnam (1994); Investigation of a Flame: a portrait of the Catonsville Nine (2001); www.House-of-Drafts.org: A Bosnian-American web collaboration (2002), and States of UnBelonging (2006). With each of these projects, Sachs strategically situates herself in relation to her subjects and challenges conventional hierarchies of historical and political inscription. Her work has been presented at the Museum of Modern Art, the Pacific Film Archive and the Sundance Film Festival as well as museums, and alternative exhibition sites nationally and internationally. Lynne teaches experimental film and video at New York University and lives in Brooklyn, New York with filmmaker Mark Street and their two daughters. Lynne’ s work is distributed by First Run Icarus (www.frif.com), New Day Films (www.newday.com) and Microcinema (www.microcinema.com). Alma Suljevic was a soldier for the Bosnian Army throughout the 1990's. Her main responsibility was to work as a de-miner. As a performance artist and a sculptor she uses these war-time experiences as the foundation for her artistic work. 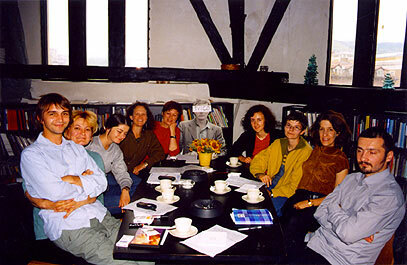 Alma is currently a professor at the Academy of Fine Arts in Sarajevo. Enes Zlater sings lead in the Bosnian rock band Sikter. He is also a media coordinator at the Sarajevo Center for Contemporary Art and a video/film artist who has shown his work throughout Europe and the United States.